We have now survived two summers in the desert. And sandwiched in between those summers has been amazing, dry and beautiful desert weather and two little girls saddened that our pool was too cold to swim in. We have a pool service that comes year round, but we can only swim in the pool for about four months. Once the evening temperatures dip below 75 degrees, it is too cold for anyone to swim, but especially Esra, whose core body temp changes quickly. We wanted to extend our family's swimming season, and we knew we could not afford to heat the pool or buy solar covers. So, why not wetsuits? 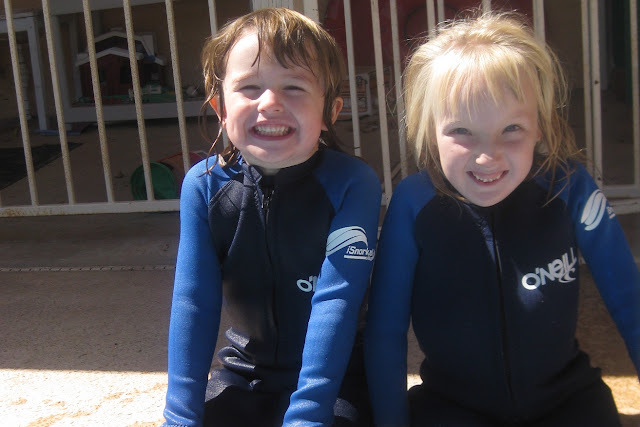 We found these O'Neill Toddler Full Frontzip Wetsuits on iSnorkel.com. Estelle is wearing a size 3 and Esra has a size 2. Her legs are as long as Estelle's but her torso is slighter and shorter. We ended up buying some booties to cover Esra's leg. Our rep, Beatrice, was helpful with sizing and care instructions. And our order came fast. Plus, nestled in the packing boxes were tiny boxes of candy. A double treat! The girls are now back to swimming after a few weeks off because of cool weather. They are just loving it. Now, Sam and I need to get our own wetsuits!